Hormone replacement is really important in premature ovarian insufficiency (POI) and early menopause as it can help with the menopause symptoms and also protect the bones, heart and brain in the long term. It is recommended that hormone replacement should be used at least until the average age of menopause (52). For many women though, finding the right hormone replacement therapy (HRT) isn’t straight forward – side effects are the most common reason why people stop HRT prematurely. 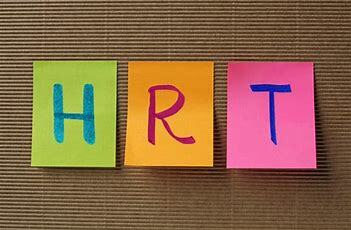 What are the common side effects of HRT and what can be done about them? Most women with POI are taking 2 hormones – estrogen and a progestogen. Estrogen-only HRT is for women who have had a hysterectomy. Estrogen can give side effects of headache, breast tenderness and mild nausea. These tend to be common when you first start hormone replacement or increase the dose but often settle after a few weeks. If they don’t settle, either changing the route of estrogen (such as switching from tablets to patches or a gel) or reducing the dose normally helps. The progestogen part of HRT is often the one that can give side effects. It can cause premenstrual type symptoms (low mood, irritability, bloating, acne, fatigue, headaches). These side effects can normally be improved by changing the type pf progestogen (for example using progesterone or dydrogesterone rather than norethisterone). Other solutions included changing the route of administration or using the Mirena® coil. Irregular bleeding on HRT is also common. If you are on sequential HRT you should have a regular monthly bleed. If you are on continuous combined HRT then you shouldn’t have bleeding – this type of HRT is normally only prescribed if you have had no periods for 2 years or more. If you are on continuous combined HRT it is common to have irregular bleeding or spotting for the first few months, however if it happens after being on HRT for 4 months or more then you should see your doctor, as you may need to have further investigation. Irregular bleeding on HRT can normally be managed by changing the type of HRT. The Mirena® coil can also be a useful option for irregular bleeding. In summary, there are many different variations of HRT and the combined oral contraceptive pill (COC) which can be used in POI and its about finding the right preparation for your body and one that fits in with your lifestyle. Your GP may be able to help you try different preparations to find one that suits you, however if not, you should be referred to a menopause/POI specialist to discuss the options.